The team tells us about starting development on the Halo-themed RTS in secret, control iteration, and more. Though it carries the Halo brand, it's only through general association that fans will come into contact with things they already know about the series. 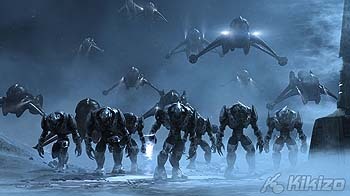 Halo Wars is set in the year 2531, during the time preceding the events in the main Halo trilogy, so there will be similar technology, vehicles and structures, but not much overlap in the cast of characters. "There's no father of Master Chief in this game, there's no programmer who wrote Cortana later. There's nothing like that," says Ryan. Not having Master Chief in the game isn't something Ensemble is all that upset about. Not only does it mean there's (slightly) less pressure on the team, but it also allows them more freedom to contribute to the Halo canon. The relationship with Bungie flowed naturally from that. 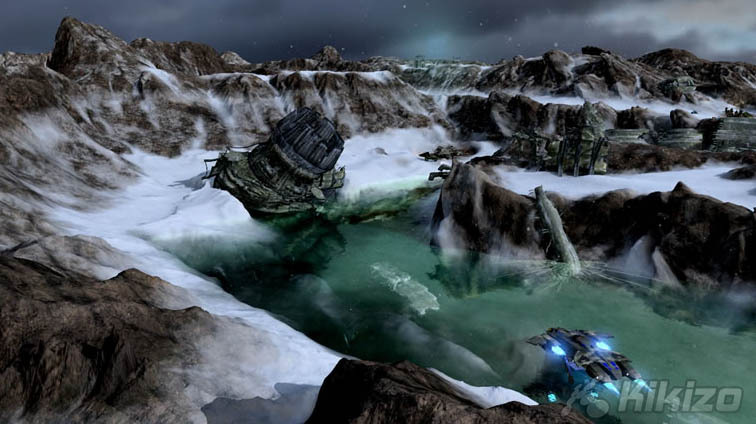 "They got very busy on Halo 3 and gave us all the leeway to go make the game without lots of oversight, and we really appreciate that," Ryan says. 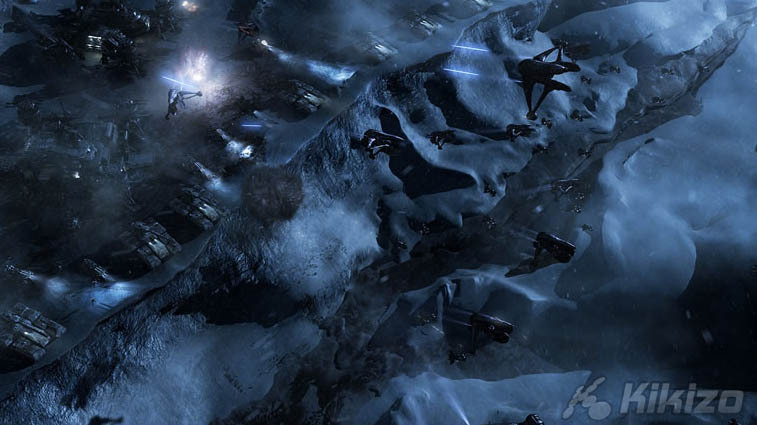 Part of Ensemble's contribution is the Spirit of Fire, a vessel in the vein of the Pillar of Autumn from the Halo trilogy, and the crew that comes along with it. Most important as far as players are concerned is Serena, the omnipresent AI character a la Cortana who will guide you through the game with voiced instructions. 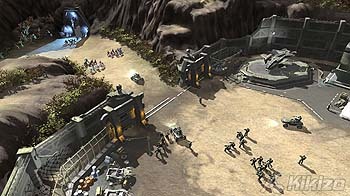 Also new to the series in Halo Wars is a new composer. With Marty O'Donnell toiling away on the soundtrack for Halo 3, the decision was made to let him concentrate on that and let Ensemble go it their own way, using O'Donnell's earlier work on the Halo series as inspiration. But don't worry, Halo fans. There's still plenty that connects Halo Wars with Master Chief's trilogy. You'll be controlling all sorts of recognizable vehicles, including the highly manoeuvrable Warthog, and characters ripped straight from the shooter games. "As long as we didn't do something stupid or break the fiction, we were able to be very creative," says Ryan. The peculiar demands of RTS games, which need a broader range of characters and vehicles, meant that the team had to come up with additions to the Halo universe. But it was careful to keep consistency too. The team actually spent a lot of time on the Warthog, working on the physics and the unique handling to make it feel just right. You'll even be able to take out enemies using either the mounted guns or by running them over, just like in the other games. At the heart of the game is a simplified control scheme that does away with most of the complexity inherent in PC real-time strategy games. 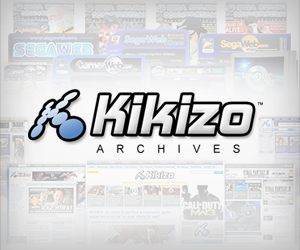 One of the earliest and most important challenges for the team was to decide on the best way to mimic left- and right-mouse-clicks. It came up with three ways. You can hover over your units with a reticle that selects your characters, press a face button to select them, and then press another one to move them. You can also double-press the button, to select all squads of the same type before doing other actions. Or, for finer control, you can draw a selection by pressing another face button, which allows you to choose only the units you're interested in before sending them in to action. Moving around the game map is handled by the D-pad, which lets you quick jump from the front line to your base and back. Requesting troops and vehicles is done through another simple method, which involves pulling up what is called the circle menu by selecting depots and other creation facilities and quickly selecting items/units to be made using the analog stick. What's most important to realize, though, is that throughout, the team has been concerned with one idea: simplicity. "The whole game can be played with just the left analog stick and the four buttons," explains Ryan. "All the other buttons on the controller are quick taps to do other things." One way you won't be able to control the game is by using a mouse. Even though it's technically possible to use one on an Xbox 360, this is not an approach Ensemble has considered. The overarching idea was to make a game that works best using the D-pad, and opening up the option of using a mouse would detract from that laser-sharp focus. Halo Wars has been conceived and developed as an Xbox 360 game and as it stands, Ensemble has no plans to do a PC port - even though Ryan wouldn't take the option off the table. What no one on the team wants to do is start thinking about a PC version before wrapping up work on the console game.